Nutrient Oxidation and Nutrient Balance Results in Hill et al. "Nutrient balance in humans: effects of diet composition", AJCN, 1991, vol. 54, pp. 10-17. The experiment provides convincing evidence that oxidation of substrates varies with intake. Fig. 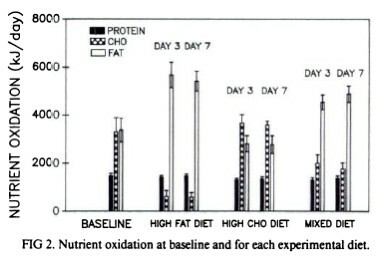 2* can also be used to verify roughly (by printing out the graph, estimating the nutrient oxidation of each bar using the scale and adding them up) that the total nutrient oxidation does not differ significantly between diets and between diet and baseline. 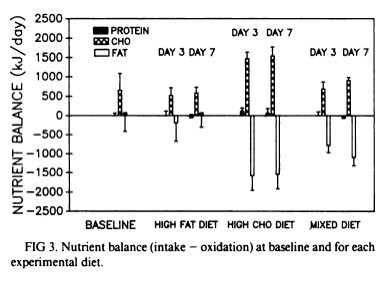 The nutrient balance calculated as 'intake - oxidation' uses the otherwise unreported caloric intake data and is shown in Fig. 3. First of all it is interesting that the subjects were in positive carbohydrate balance at baseline - the mean value (although we are told that inter-subject variation was large) is about 144 cal/day** (and about 24 cal/day or less for fat balance). The authors of the paper describe the fat balance of the baseline diet as 'near-zero' - this is presumably because there is again considerable intersubject variation - indicated by the error bar extending out to about -167 cal/day. But where is the excess carbohydrate going? Well, it could be filling up glycogen stores, but equally, if the glycogen stores are full, it could be converted and stored as fat. Just because it appears in the 'carbohydrate' column, does not mean that it is not being converted to fat for storage. The fat column is fat intake minus fat oxidation, which does not preclude fat storage from another source - it was not possible to measure the exact amount of fat going into the subjects’ adipose. "such that by day 3 fat balance was maintained near zero and remained near zero through day 7 "
but by day seven, they were in positive fat balance (burning less fat than consumed)--hence, on day seven they were storing dietary fat in adipose. 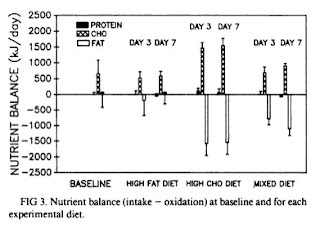 This happened despite the fact that they had increased fat oxidation. Decreasing dietary carbohydrate forced the body to burn more fat, but because they were consuming a high fat diet, they were consuming more fat than they could burn in a day, resulting in a positive fat balance....increasing adipose. So the mere fact of consuming a high fat diet causes you to automatically consume more fat than you can burn in a day??? "It is important to note that total fat oxidation did not increase when subjects were given the high-carbohydrate diet. Rather, negative fat balance resulted because dietary intake of fat decreased dramatically while fat oxidation decreased only slightly ." No, the real increase in fat oxidation occurred in response to the HF diet (and to a lesser extent in the mixed diet which was only 35% carbohydrate). What is of interest is that all diets had positive carbohydrate balance. Now in the case of the HC and mixed diets there also appears to be a caloric deficit (-36 to -12 cal/day over the two days of the HC diet and -48 to -60 cal/day over the two days of the mixed diet), so the positive carbohydrate balance just represents a shuffling of substrates. In the HC diet case it might represent a ‘carb loading’ response - maybe the body was taking the opportunity to top up glycogen stores in response to the higher carbohydrate intake. Some of the carbohydrate might have been used for non-oxidative purposes such as making glycoproteins, but equally some of it (the fructose at least) might have been converted to fat. On the other hand, in the HF diet (as well as baseline) case it appears that there was a positive caloric balance (+155 to +167 cal/day at baseline, +72 to +107 cal/day over the two measurement days of the HF diet). In this case, perhaps the excess carbohydrate was converted to fat – what else can have happened to it? The authors state that the experiment was conducted in conditions of 'near energy balance' and it appears that, within the error margins of their methods, they may be justified in making that claim. The negative and positive caloric differences are very small. However, information such as caloric intake – which could be compared with daily energy expenditure for days 3 and 7 - has not been shown. Also the results of the body composition weighings are not shown or even mentioned again. "The data do suggest, however, that high-carbohydrate diets may be more effective in body-weight management than are high-fat diets fed at the same level of total calories owing to the greater negative fat balance seen under high-carbohydrate-feeding conditions. " As Tom Naughton would say: Head. Bang. On. Desk. *The figures have been copied from the post at Primal Wisdom. **All values in the paper are given in kJ which are about 4 times bigger than the more familiar ‘calories’ (actually kcal), here they are converted to nutritional calories. *** In a way the authors are refreshing in sticking to conclusions about their original aims.